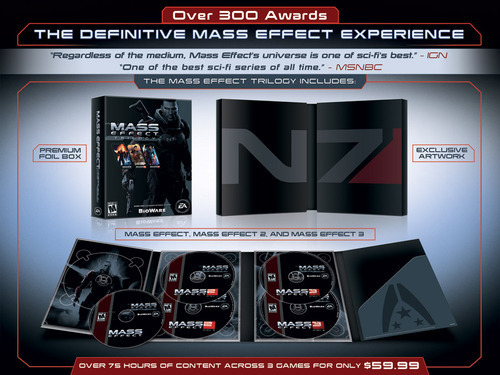 A little while back EA and Bioware announced that they would release all three Mass Effect games in one package called the Mass Effect Trilogy. The bundle was slated for a November 6th release date for both Xbox 360 and PC but no word was given on the PS3 release date, until now. The Playstation 3 version of the bundle will launch on December 4th in the United States and December 7th in Europe. What makes this bundle so special on the PS3 is that it will contain the very first Mass Effect. Previously, PS3 players were not able to play it due to the fact that Microsoft owned the rights to it for a time. You will be able to transfer saves files from the first one as well. Also today we now know what DLC will be coming with the PS3 version. Mass Effect will come with Bringing Down The Sky DLC but strangely not the Pinnacle Station. Mass Effect 2 will come with the Cerburus Network, Zaeed, Normandy Crash Site, Kasumi, Overlord and Lair of the Shadow Broker. Mass Effect 3 will come with none of the DLC released thus far.